Lakeside Financial Group | Planning now so you won’t have to worry about tomorrow. Planning now so you won’t have to worry about tomorrow. I actively serve in my professional association, National Association of Insurance and Financial Advisors. I have been a member of the Million Dollar Round Table since 1997 which includes seven Court of the Table qualifications. In 2006, I was a breakout speaker at the Million Dollar Round Table meeting in San Diego. In 2009 I was the recipient of Advisor Today magazines “4 Under 40 award” as one of four young advisors who have built a career by working hard, putting their clients first, and giving back to the industry. My greatest accomplishment is my relationship with my 4 children and wife: Claire, Olivia, Dominic, Victor, and Dianna. I offer insurance and financial products and services for individuals, businesses and their employees. My stringent code of ethics places the client’s needs above all others and demands uncompromising integrity in every aspect of my business conduct. My primary objective is to help you achieve financial freedom in a complex and constantly changing world by recommending products that can help you achieve what is most important to you. Before I recommend any product and/or service, I ask questions and get a clear understanding of your circumstances and financial objectives. I then analyze your insurance and investment portfolios to identify any gaps that may exist. I will provide you with suggestions to fill in the gaps and help you reach your objectives more efficiently. I will work with you to implement our agreed-upon strategy and help you secure the required products and services. Financial Services Representatives can help you with many of your financial needs. It is important to note that Financial Services Professionals are only able to provide certain services if they are licensed to do so. *Check the background of MML Investors Services, LLC on FINRA's BrokerCheck. CRN201905-208843 I am licensed to sell Insurance products in the following jurisdictions: AZ, CO, IL, MN, NE, WI I am registered to offer securities products in the following jurisdictions: AZ, CA, CO, FL, IL, IN, MN, NE, SC, TX, WI We cannot communicate with, nor respond to requests from users who reside in jurisdictions where we are not licensed to conduct insurance and/or securities business. 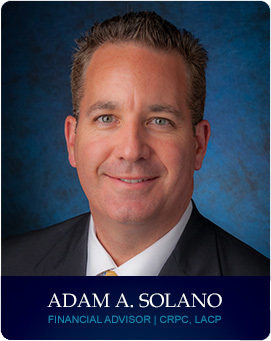 Adam Solano is a registered representative of and offers securities, investment advisory and financial planning services through MML Investors Services, LLC Member SIPC (www.sipc.org) Lakeside Financial Group - 34121 N Route 45, Suite 208 Grayslake IL, 60030. Tel: 866-293-9150 Lakeside Financial Group is not a subsidiary or affiliate of MML Investors Services, LLC or its affiliated companies. One North Franklin Street Suite 2470, Chicago, IL 60606, Tel: 312-984-1000 Copyright © 2017 Lakeside Financial Group. All rights reserved.